Chickens have been producing eggs for thousands of years. The average healthy laying hen will produce between 200 and 300 eggs every year. Modern hens have been bred to encourage high egg production, but good breeding doesn't replace the need for quality care for your laying hens. Modern chicken coops provide creature comforts that can improve your chickens' egg yields. Chickens are biologically designed to lay eggs. Hens who are left loose to fend for themselves, or who escape from the coop and receive no human care, still lay eggs so long as they are healthy and can find enough food. A healthy hen doesn't need a rooster, a coop, a nesting box or anything else to produce eggs. Just because chicken coops aren't necessary for chickens to lay eggs doesn't mean coops don't help. When all your hens are in one place, you can make sure they're getting plenty of food and water. Hens who have ample food, water and shelter are generally healthier than those who are struggling to get by. Healthy hens lay more eggs. A nesting box provides a safe, individual location for a hen to lay her eggs. Nesting boxes give shy hens privacy, and they help keep them from trying to lay eggs in secluded corners of the coop or outdoors. Nesting boxes also help prevent hens from trampling or otherwise damaging the eggs, which they often do if the eggs aren't in a safe, well-cushioned location. A hen might not lay eggs if she's sick, not getting enough to eat, too old to lay, of if she's gone broody. Broody hens sit on their existing eggs and wait for those eggs to hatch, without laying more eggs. Another possibility is that your hen is laying and you aren't finding the eggs. 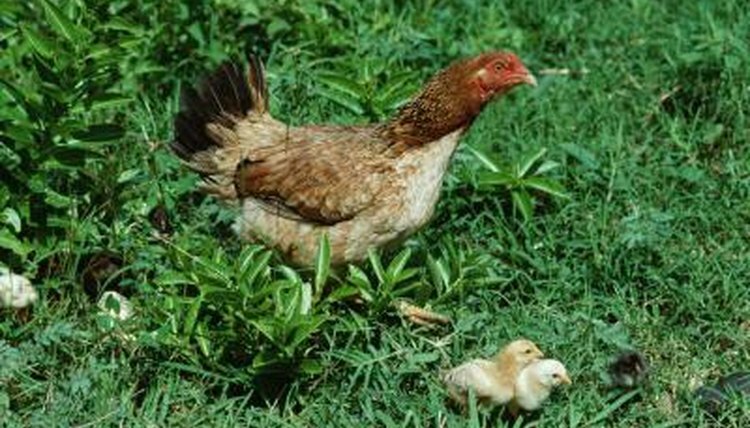 Free-range hens, those with access to the outdoors, often hide their eggs. Hens also sometimes eat their eggs. Does Having a Rooster Around Make Hens Lay More? Are You Supposed to Put Straw or Hay in a Chicken's Nest?